Global sourcing of labor and material resources has brought about the need to connect employees in multiple locations across the globe, bridge business processes, cultures and languages in order to deliver organizational excellence. This has enabled management of workforce across multiple locations, while allowing for implementation of a uniform, global, corporate HR strategy. 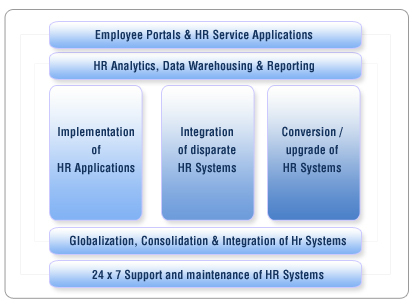 HR-IT is the technology enablement of this HR strategy. It covers all the systems and processes that support employee management from "Recruit to Retire" functions within the organization. Increased adoption of HR-IT has enabled companies to set up global shared services centers and outsourcing of HR processes. Recently, HR-IT has gained significance since most organizations have been using technology to transform HR, to increase HR productivity, to improve employee experience and to maximize the value of the company's most important asset- employees by aligning their skills, activities, and benefits with business objectives and strategies. Covering "Recruit to Retire" HR functions, our service range is designed to serve as a bridge between HR strategy, processes and technologies - thereby enabling your HR to better align with an ever increasing business role. Payroll Application, HR Application Outsourcing, Enterprise Learning Management, Portal Implementation/Integration and HR Analytics are key components of the solution set. © 2008-2019, Nova Cloudware. All rights reserved.